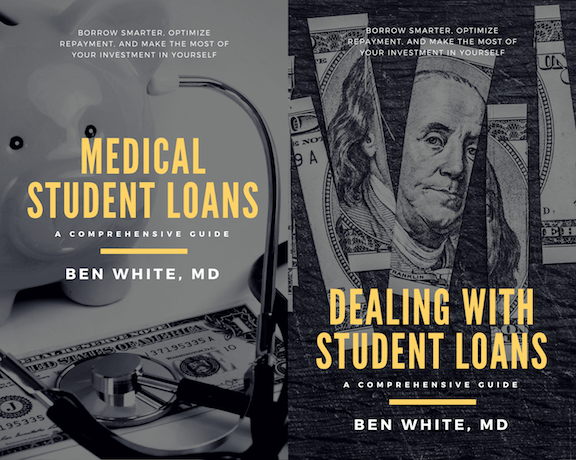 I’ve been a bit slow on expanding the availability of my two books on student loans, but as of today, Medical Student Loans and Dealing with Student Loans are now available on Apple iTunes/iBooks as well as from Amazon. Last year I published a book about managing student loans for medical students and doctors. Earlier this year I extensively revised that into a new book for a general audience. This week, I updated both books. And now, I’m giving them away for free (at least until the end of July 2018). Student loans are now depressingly the largest category of consumer debt outside of mortgages. With another graduating class hitting the workforce, I wanted to make my student loan books available to everyone. These are around 45k words, so they’ll take a few hours to get through, but it’s time well spent. Amazon doesn’t easily let you give away free books these days, so I’ve discounted them to $9.99 $2.99. To get a copy for free, you can download one from your inbox by signing up below for my forthcoming very infrequent/sporadic email newsletter. And, if you aren’t interested in ever hearing from me again, then just hit the unsubscribe link in the first paragraph of the download email. I don’t have any interest in cluttering your inbox. If you’re a medical student or physician, click the box for Medical Student Loans. If you’re anything else, click the box for Dealing with Student Loans. These are essentially the same book adapted for different audiences. You only need one. Please consider sharing this. There are very few good resources for student loans and a lot of misinformation. I wrote these books because no one else had. I hope you enjoy them. There were two developments that led to me implementing new workflows to get my writing done. I’ve been interested in different writing environments and different tools for longer than I’ve actually done any significant writing but always fell into the typical trap of spending more time researching what to use than I ever spent actually using anything other than the built-in post editor for WordPress and Microsoft Word. The first was the birth of my son 3 years ago. I don’t know what I used to do with all of that time, but it became clear that with priorities of being a father and then being a physician that I would need to be more deliberate in carving out a niche for writing. The partially-related second development is that I started to do a lot more writing on my iPhone. To write effectively on the phone, you need a tool that allows you to get words down quickly and keep your snippets and thoughts organized. Another big plus is solid syncing so that you can switch back and forth on the same project on other devices seamlessly. Last year, I had a two-app system. WorkFlowy for my snippets, lists, and braindumps. I previously wrote about how I used this awesome free service (with completely optional paid upgrades) to write my second book. Then when it was time to sit down and really flesh out that manuscript I used Ulysses. I even had my entire to-do list in Workflowy for a while. This worked great. But I found that my post snippets and drafts were numerous enough that they started to get cluttered and lost in my tangle of multi-layered WorkFlowy outlines. I use the app for so many different things that it took time to find the right place to put the right snippets, and I didn’t have the time to sit down and use the Web app to re-organize frequently enough. Workflowy is awesome for unstructured data entry, but it was less good for building up multiple drafts simultaneously, which was especially tricky because I was using it for so many different things that I had to navigate through frequently. These extra seconds sometimes meant either losing organization or losing a thought I wanted to transcribe. The simple solution was staring me in the face the whole time: Bear. Now, it didn’t actually have to be Bear. It could have been any decent note app. Byword, iA Writer, and even the built-in notes app would all work the same. Bear just happens to be a particularly well-crafted one that is super responsive, a pleasure to use, and has a robust tagging system (and was perhaps coincidentally the one I was testing out when I figured out my new plan). Bear is completely free to use and $15/year for premium features like cross-device syncing. What I needed to optimize for my phone writing workflow was an app for long projects which is well organized and synced to my computer (Ulysses). An app for lists and brain-dumping and especially for building up lots and lots of snippets for longer works (WorkFlowy). And—and this was the surprise/revelation—an app just for blog posts. I think most people intuitively want to use fewer apps. The view of so many app reviews and so much productivity writing is that if you just find the right system or best workflow that everything in your life magically falls into place. The truth is that putting the hours in and developing good habits are what gets results. The tools are just lubrication. So originally, I wanted to find the right thing that works for everything. Ulysses is basically perfect for that. But I wear different kinds of writing hats and write different kinds of things on my phone so having Bear dedicated to fleshing out a limited number of brewing blog posts is extremely efficient for me, even if it also results in a little additional clutter on the home screen.